Harley Howard Sutton, Sr., DVM, 94, passed away Wednesday, November 22, 2017 in his home in Jamestown, TN. He was born March 4, 1923, he grew up in Aurora, IN, and was the son of the late George S. and Mary Tandy Sutton. An Army veteran of WW II, he served with the 129th Cavalry Horse, 2nd Armored Division. He was a graduate of Michigan State Veterinary School. In July of 1949 he married Davona “Davy” Williams in San Francisco, CA. That same year he began his veterinary career in Lexington, KY. working in equine practice with Dr. D.L. Proctor. In 1957 he joined Dr. Ed Taylor in Georgetown, KY. 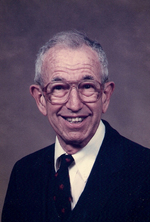 He served as president of the KY Veterinarian Medical Association that same year. In 1970 he built Central Kentucky Veterinarian Center. Harley was named, “Outstanding KY Veterinarian of 1971.” He was passionate about his profession and often mentored young veterinarians. Harley’s love of horses began at an early age and continued throughout his life. He loved gardening, wood-working, sailing and was an active member of the Wildcat Investment Club, Spokes and Spurs Driving Club, and enjoyed UK basketball. While living in Georgetown, he was an elder at First Presbyterian Church and later attended Mt. Horeb Presbyterian Church. At the age of 71 he retired from his practice. In 2006 he and Davy moved to Jamestown, TN to live closer to their son, H and daughter-in-law Kaki. He attended First Baptist Church of Jamestown. He is preceded in death by his wife of 63 years, Davy, an infant daughter, Wendy Sutton and two brothers, Carroll T. Sutton and John L. Sutton. He is survived by his children, Sherrie (Steve) Bryant, Collinsville, VA; George F. (Sara) Sutton, DVM, Georgetown, KY; Harley H. (Kaki) Sutton, Jr, DVM, Jamestown, TN; Claire (Tim) Upshaw, Kingsport, TN; grandchildren, Jennifer Bryant Brown, Jeffrey Bryant, Tandy Sutton Repass, Ellen Sutton Cole, Daniel Sutton, Drew Sutton, Morgan Sutton Stone, George C. Sutton, Julie Upshaw Hanks, Bryan Upshaw and Amy Upshaw; and 23 great grandchildren. Funeral services will be 11 AM Saturday, December 2, at Johnson’s Funeral Home. Visitation will be 9 AM till service. In lieu of flowers, memorials may be made to Central Kentucky Riding for Hope, PO Box 13155, Lexington, KY 40583.